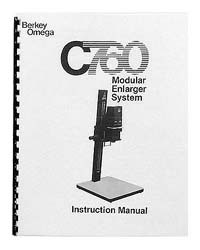 High quality copy of the original Omega instruction manual for the C760 chassis and condenser lamphouse. This deluxe reproduction features a comb binding so it will lie flat for easy reference, front and back covers on heavy cover stock, and a clear plastic cover page for protection and durability. Our C760 manual includes parts diagrams and parts lists for the C760 chassis and condenser lamphouse. 8½" x 11" format. Comb bound. 15 pages plus parts diagrams and technical memo. Note: For C760 enlargers fitted with the C760 Dichroic, Diffusion, or VariCon Lamphouses, we recommend that you also purchase the "Omega C760 Dichroic Lamphouse Instruction Manual".